Background: An intricate interplay between innate and adaptive immune cells is crucial for an effective immune response during disease, infection and vaccination. This interplay is mainly performed by dendritic cells (DCs), which are professional antigen presenting cells with unparalleled capacity to translate innate to adaptive immunity. They effectively recognize and uptake antigens, migrate to lymphoid tissues, and activate naïve T-cells. Indeed, DCs have numerous germline encoded pattern recognition receptors (PRR) that recognize conserved pathogen associated molecular patterns (PAMPs) or danger associated molecular patterns (DAMPs). While some PRRs like Toll-like receptors (TLRs) recognize PAMPs and DAMPs at the cell surface and in endosomal/lysosomal compartments, others, such as NOD-like receptors (NLRs), act as cytosolic sensors. NLRs activation through recognition of PAMPs and DAMPs leads to the assembly of signaling multimeric protein complexes named inflammasomes. Inflammasomes are important regulators of caspase 1, the enzyme responsible for the proteolytically cleavage of precursors’ pro-IL-1β and pro-IL-18 into their active form. Objective: To unveil how inflammasomes are related to maturation, migration, antigen presenting function and DCs ability to fine tune adaptive immune responses. Conclusion: Several studies show that in danger/infectious scenarios NLR and TLR synergize to expand DCs maturation, migration, antigen presenting function and adaptive immune system activation. However, in the absence of a danger scenario, and without TLR engagement, inflammasome activation stimulates an immunosuppressive profile on DCs. Overall, it is clear from literature that activation of the inflammasome in DCs should not be viewed in isolation but rather considering its interconnections with the various PPRdriven pathways. 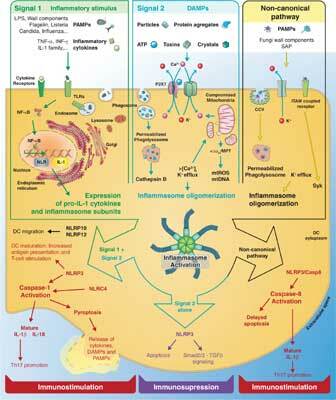 Due to the increasing evidences of inflammasome involvement in multiple inflammatory and immune diseases, this information is of utmost importance since precise inflammasome pharmacological targeting could lead to considerable clinical utility through fine-tuned targeted therapies. Keywords: Adjuvanticity, dendritic cells, inflammasome, NLR, TLR, NLRP3, DAMPs. Keywords:Adjuvanticity, dendritic cells, inflammasome, NLR, TLR, NLRP3, DAMPs. Abstract:Background: An intricate interplay between innate and adaptive immune cells is crucial for an effective immune response during disease, infection and vaccination. This interplay is mainly performed by dendritic cells (DCs), which are professional antigen presenting cells with unparalleled capacity to translate innate to adaptive immunity. They effectively recognize and uptake antigens, migrate to lymphoid tissues, and activate naïve T-cells. Indeed, DCs have numerous germline encoded pattern recognition receptors (PRR) that recognize conserved pathogen associated molecular patterns (PAMPs) or danger associated molecular patterns (DAMPs). While some PRRs like Toll-like receptors (TLRs) recognize PAMPs and DAMPs at the cell surface and in endosomal/lysosomal compartments, others, such as NOD-like receptors (NLRs), act as cytosolic sensors. NLRs activation through recognition of PAMPs and DAMPs leads to the assembly of signaling multimeric protein complexes named inflammasomes. Inflammasomes are important regulators of caspase 1, the enzyme responsible for the proteolytically cleavage of precursors’ pro-IL-1β and pro-IL-18 into their active form.